When it comes to exploring Thailand, most people think that they’ve seen it all. Being that it is one of the most visited destinations in Southeast Asia, it is very rare to find places that are virtually unheard of. Being a lover of travel and adventure, although I enjoy seeing popular tourist attractions, for me, exploring off-the-beaten-path locations is what I love the most. After both traveling and living in Thailand extensively, here are a places to visit in Thailand that are worth fitting in your itinerary. Located in the beautiful low key province of Ubon Ratchathani close to Laos, you will find Sam Phan Bok, otherwise known as the Grand Canyon of Thailand. Unlike the Grand Canyon in Chiang Mai, Sam Phan Bok is a natural land formation made up of unique land formations, as well as a river with little pools of water. 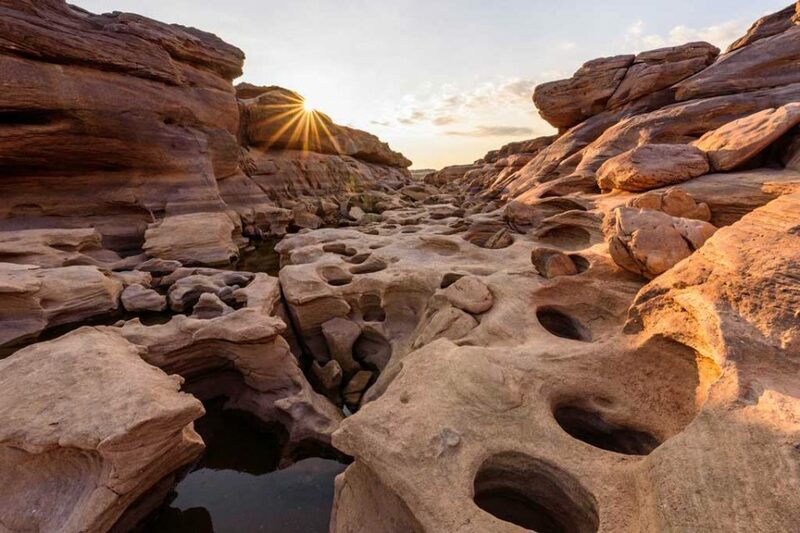 The place is called Sam Phan Bok which translates to three thousand holes due to the 3000 icecream-scoop-like holes on the ground. Holes, basins, and various depressions fill the area as far as the river stretches. As the place is very peaceful and tranquil, it is common for photographers to come to this place at night in order to capture the beauty of the milky way. Most people recommend visiting during the dry season (December-June) in order to see the many holes and imprints that you can see when the water levels of the river is low. Sam Phan Bok is located near the town of Song Khon, a 75 km drive north of Khong Chiam along Highway 2112. 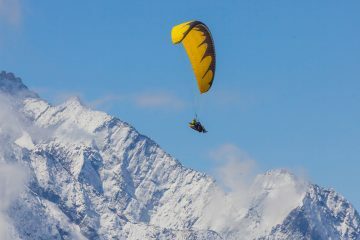 You will need your own transportation to get here so consider hiring a motorbike or a car. Ubon Ratchathani is 115 km to the southwest along highways 2050 and 2337, and Mukdahan is 130 km to the north along highways 2034 and 2242. While most temples in Thailand are intricately made up of gold, precious stones and jewels, Wat Pa Maha Chedi Kaew is quite unique as it is made up of thousands and thousands of beer bottles. While I would love to say the temple was built after a year-long epic battle of beer pong, the reality is in 1984, a group of monks grew tired of the litter and rubbish near their area. 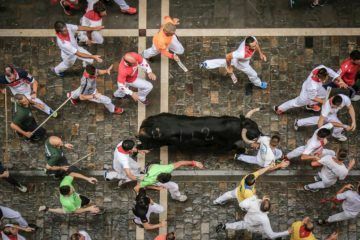 To help promote recycling, they encouraged the locals to start bringing their recycled beer bottles in order to create this popular temple complex. 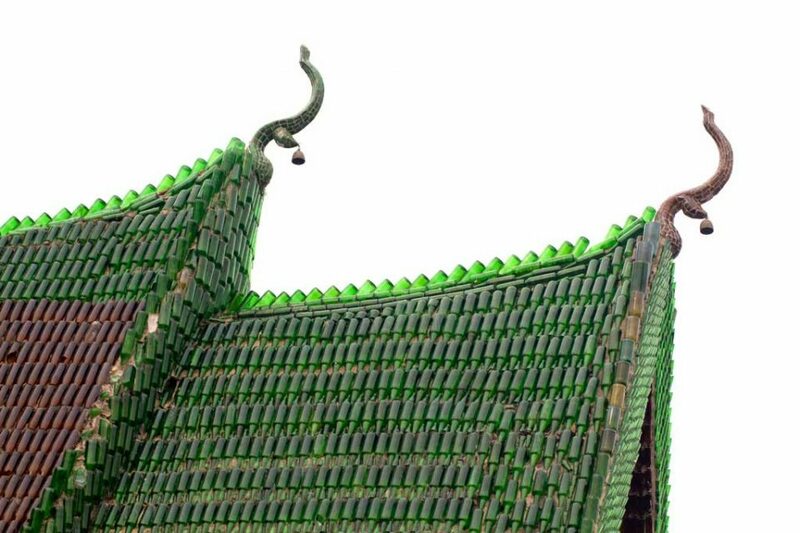 Using brown bottles of Chang beer and green bottles of Heineken, the monks created this impressive temple which is made up of almost 1.5 million bottles of beer. If you ever pay a visit, you can’t help but admire the monks’ craftsmanship and dedication to building this unique temple complex. Not to mention the amount of beer the local village people drank for this cause. Legends. Located in the Khun Han district of Si Saket Province. To get there from Si Saket town, take Highway No. 211 (heading to Amphoe Phayu and Phrai Bueng). Editor’s Note: Traveling around Thailand? Check out our complete Thailand Travel Guide featuring the best places to stay, what to eat, and the best things to do. 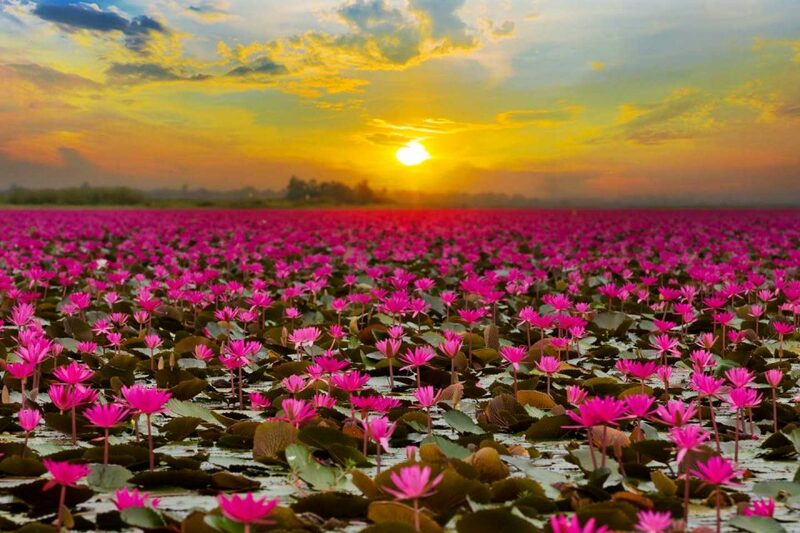 If you ever want to see a sea of pink and red lotus flowers, a trip to Udon Thani is a must! Every January, the lake Nong Han in Udon Thani is covered with thousands of water lilies stretching out as far as your eyes can see. The best time to see this natural occurrence is at the beginning of December all the way to the end of February. The best time of day to see the lotus blossoms is from 6:00 am until noon when they are in full bloom. Due to the overflowing amount of pink and red flowers, this place is pretty popular during Valentine’s Day weekend. There is also a Red Lotus Sea Festival which is held in mid-January every year at the nearby Wat Bandiem. The best way to see these flowers is to hire a local boat to drive you around the lake. Located near the Udon Thani Province, you can head to the Kumphawapi district which is located between Udon Thani and Khon Kaen. From the Udon Thani Airport, the lake is around 50km. Editor’s Note: To save time when moving from one island to the next, download the Skyscanner App. You can also use Bookaway or 12Go to see the ferry,bus, and train schedules and book ahead of time. I am cheating a little bit with this one as it isn’t necessarily a place but it definitely is up there when it comes to unusual things to see (and do) while in Thailand. 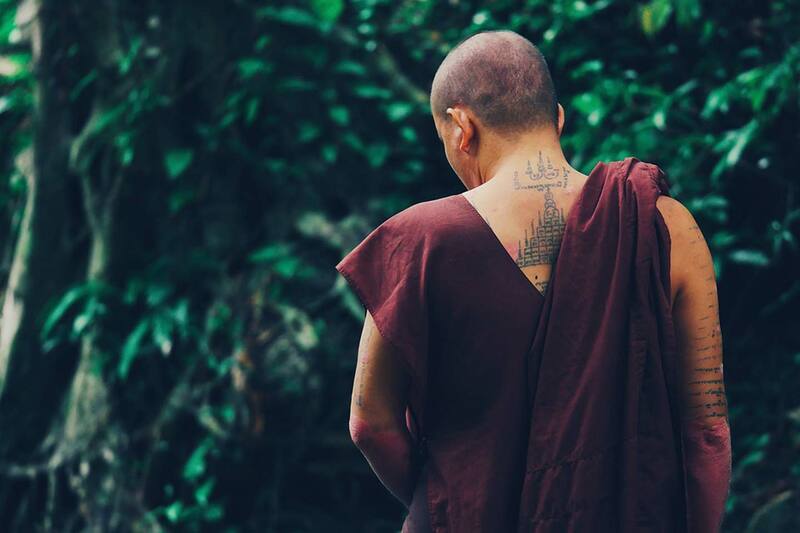 The tattoo will be administered by a monk and is traditionally done with a bamboo stick and is considered one of the most culturally immersive experiences. Getting a Sak Yant tattoo is not just a souvenir but is rather an entire experience which is deeply rooted in the Thai culture. If you want to read more about it, you can check it out here. I love visiting fascinating places, especially when they have odd mythology surrounding it. 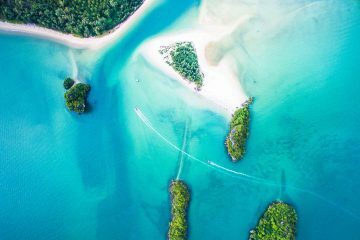 Located off the coast of Koh Lipe, you can charter a long tail boat and visit Koh Hingham, an uninhabited island made up of black pebbles. 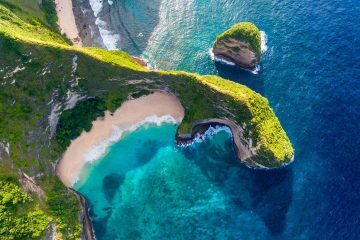 While there is nothing special about this particular beach, it is rumored to be protected by the God of Tarutao, a Thai deity who curses anyone that dares to take a pebble off the island. The funny part is that every year, the National Park office receives dozens of stones sent back to them via mail from people who want the curse lifted. 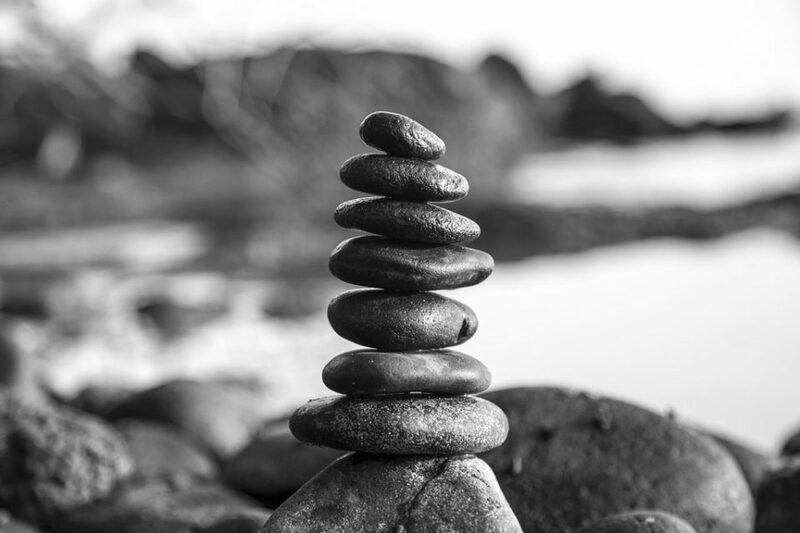 While many people head here just to play with the stones and create messages using the white pebbled stones, nicking a stone from here could just mean that you will just end up with bad luck…so beware. As mentioned, from Koh Lipe, hire a long tail boat and head to this uninhabited island. If you join the island hopping tours in the area, this is a stop that is sometimes included. Related: Looking for the best beaches in Thailand? Take a look at a few of our top picks! 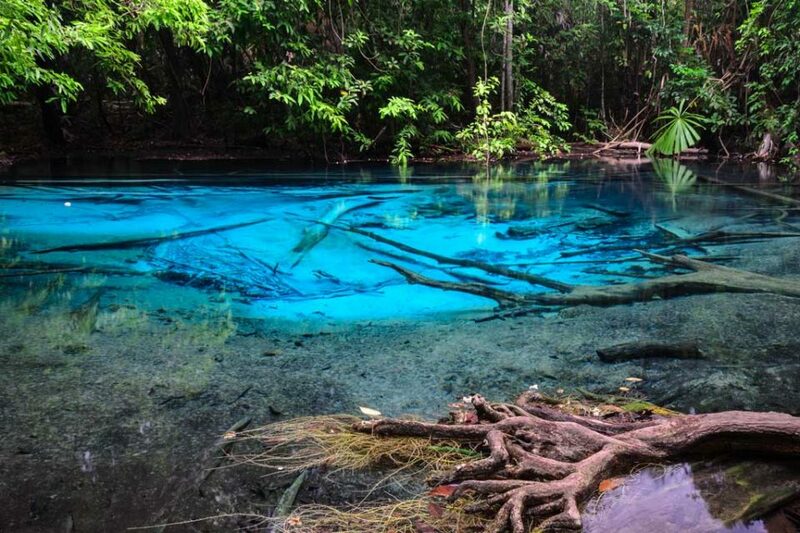 Erawan National Park is located in Kanchanaburi Province and is frequented by locals. The main feature of this place is the beautiful Erawan waterfalls composed of seven tiers and layers. What sets this place apart is the emerald green ponds, named after the three-headed white elephant from the Hindu mythology. The top tier of the falls is said to resemble the elephant’s head. From the car park, the trail to the seven tiers starts off as flat and mostly paved until you reach the first waterfall. Every stop has an area where you can swim in little water pools of water. The park is generally very busy during the weekends and public holidays so we recommend paying a visit during the week to avoid the busy crowds. Each section of the waterfall has different features so a visit to them all is something I definitely recommend. 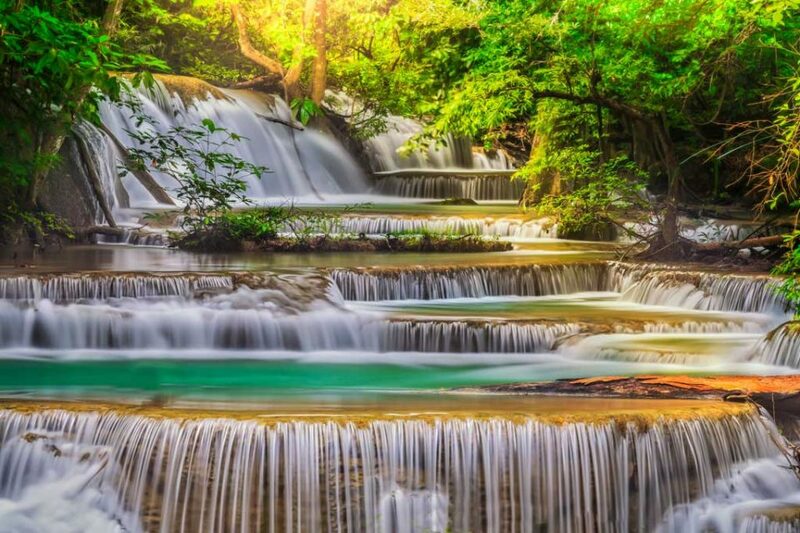 The Erawan Waterfall sits in the Kanchanaburi Province and is roughly 193km or 3 hours drive west of Bangkok. There are many signs pointing to this popular tourist destination. If you want to see something really out of this world and unusual, Thailand has its own version of the Stone Henge. 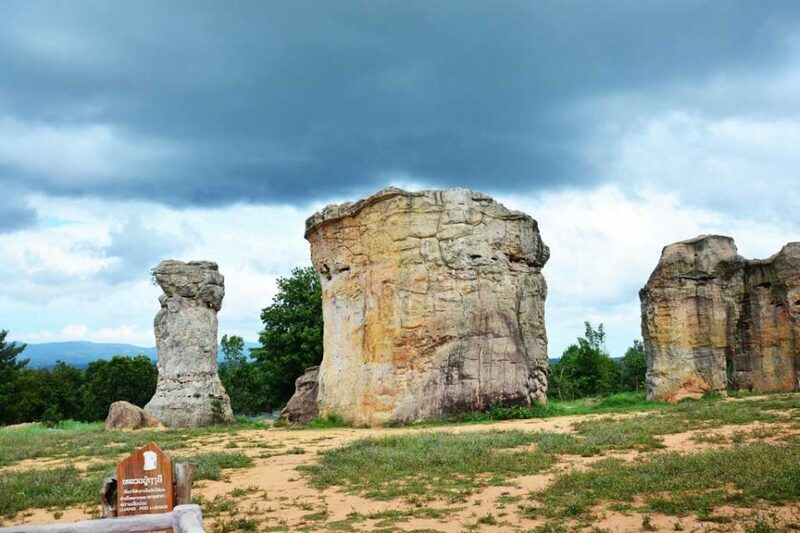 Located in Chaiyaphum, this place has a wealth of national parks that are worth exploring. Being that it isn’t frequented by many, the locals here aren’t as jaded with tourism as most places in Thailand. Although do take note that most national parks in Thailand enforce dual pricing for locals and foreigners. In this place, you can find odd rock formations that protrude from the ground. Similar to the stone henge, no one knows how they got there and how they were formed. The place itself is pretty spectacular as you gaze up these large rock formations and at the blue sky often littered with clouds. Chaiyaphum’s main town is 333 kilometers from Bangkok. There are several buses a day from Bangkok to Chaiyaphum and the journey takes around 5 ½ hours from Mo Chit bus station. There is also a VIP bus from running from Mo Chit to this area. 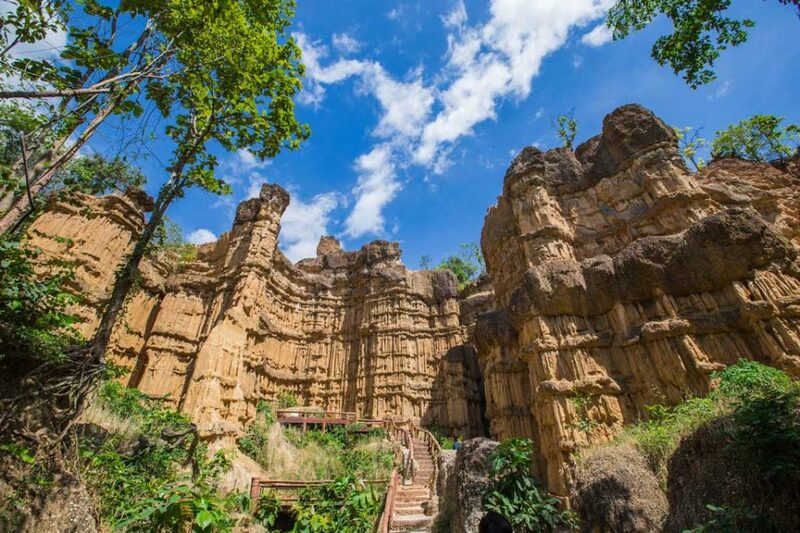 If you want to explore more national parks, head on over to the nearby Khao Yai National Park. Use Bookaway or 12Go to see schedules ahead of time. 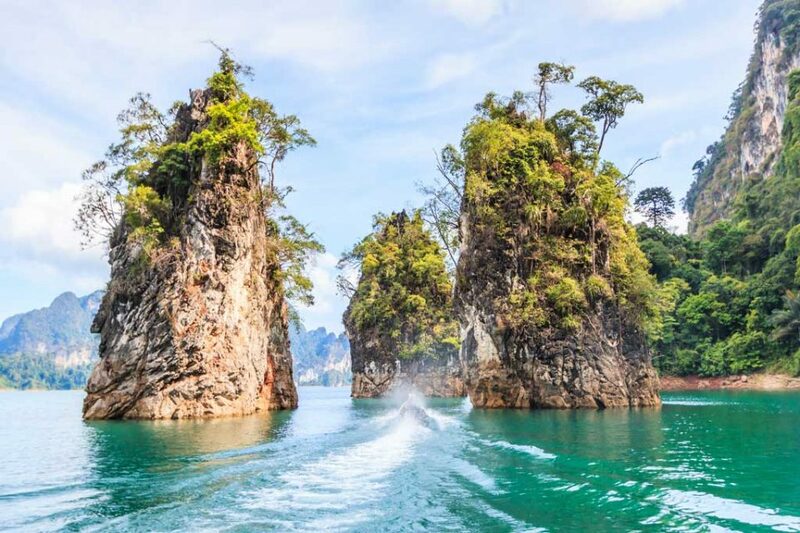 Located in the popular town of Krabi, Sra Morakot is a day trip that we urge everyone to take. While the beaches of Krabi are hard to resist, trust me when I say that a visit to this enchanting emerald pool of water is worth it. The pond is created from a natural water stream coming from the forest. There is an entrance fee of 200 THB which is collected by the entrance. We recommend going during the weekday to avoid the crowds. Mornings are also best as it is often uncrowded. As soon as you get there, you will see the crystal lagoon or the crystal pond gleaming in the sun. Here, you can take an enchanting dip to cool off. Sra Morak is located about 60 kilometers (36 miles) outside of Krabi Town and another 15 km from the beaches. Rent a motorbike and drive your way down here for a fun day of exploration. Located 112 kilometers from Chiang Mai is a town called Lampang. While exploring the town could be heaps of fun, the main highlight of the place is the Chaloem Phra Kiat Phrachomklao Rachanusorn temple complex (whew, what a mouthful!). This temple complex is perched on top a rocky hill and is such a beautiful sight to see. 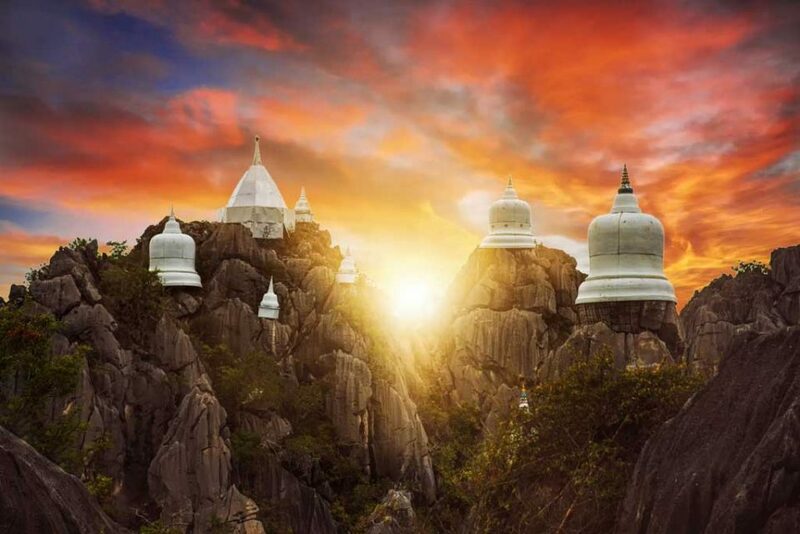 These gleaming white bell-like stupas are perched high on top of rocks and is a known Buddhist pilgrimage site as a footprint of Buddha was rumored to have been found here. From the town of Lampang, you can barter with a Songthaew (local red jeepney trucks) to take you to this popular tourists site. Surrounded by lush forests and trees, this temple is pretty unusual and is worth the detour. If you’ve ever seen the movie Avatar, the limestone karst mountains in the film is something that people often remember. Located not far from Surathani Province, you can see these avatar-like mountains as you cruise along the Ratchaprapha Dam. Dubbed as the “Little Guilin” named after the mystical mountains in China which was the real-life inspiration of the Avatar mountains, you can go here for the day or opt to stay in the peaceful floating houseboats along the dam. From Surat Thani city center, you can rent a motorbike or a car and take Highway 401 toward Ban Ta Khun District (approx. 42 km). After entering, continue for approx. 12 km until you reach the dam and pier where you can hire a boat. Right by Mae Wong National Park in Chiang Mai, Thailand you can find this unusual land formation and tourist attraction called Pha Chor. Caused by a natural phenomenon, these rock formations are the result of erosion, wind, and rain. Geologists believe that thousands of years ago, this area was a part of the Ping River until erosion formed these high hills and cliffs. They have since built a set of stairs which you can use to explore and climb around. How to Get Here: Similar to most places, rent a motorbike, car, or contract a songthaew driver to take you here. The place is towards Doi Tao District. While I could go on and on about other places in Thailand that are worth visiting, here are a few hidden gems which aren’t usually part of the usual tourist itinerary. For those that want to go off-the-beaten-path, a trip to these attractions are a must! So much place, to see, about what, I just found out! I’ll take a note for my second trip to Thailand. Now my mother told me, that she wants to come with me in this time, I said ok, but you will buy tickets! Haha. We will travel to city Chiang Mai first, to let her see on the main temples of that area. She has a license, so we can finally rent scooters for both of us, and went to mountains. Last time I rented at Catmotors company, if I’m not mistaken, they give motorcycles for a very cheap price. Then in next few weeks, we plan to went to the ocean, maybe on island Phucket, I don’t know. We’ll see any way. Can’t wait for this trip, already! Interesting post. 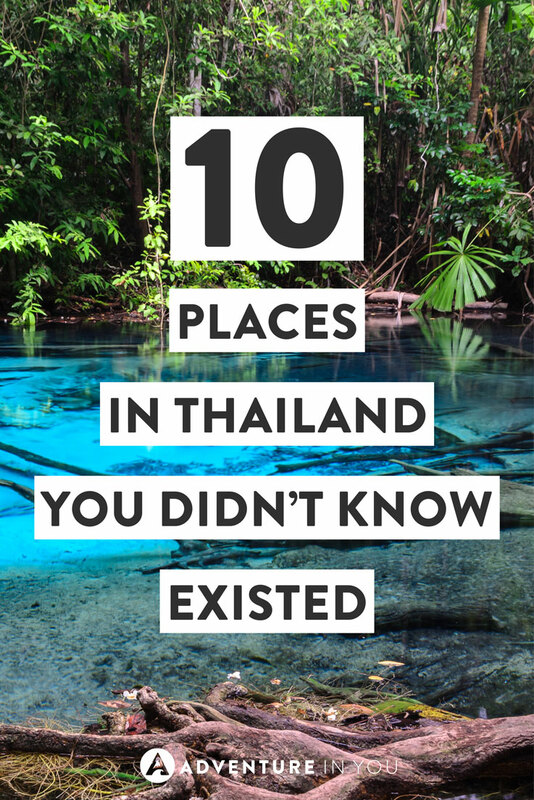 I have been to Thailand twice but only saw once of the ones youve mentioned. I saw the Erawan Falls last summer and they are not so beautiful as everybody says. I think Erawan falls really depends on the season! When we saw it, it had been raining for a few days prior so the falls itself was very impressive!